Yes. Same here if i dont pull enough vcore windows stuck on loading screen or dont ever finish the load. Its only lack of vcore. Yeah, in windows you are stable because XFR2 kicks in and will lower your frecuency according your load. It seem that on loading screen the CPU goes up to the maximum frecuency on your XFR2, so if you have a lazy core you got a kernel panic. So you say it's an instability at high frequency, not in idle, i tought the opposite because i cannot get it to crash on OCCT, any memtest or during gaming, but with offset at -0.1 it used to crash in idle sometimes. Will try to simply increase LLC without touchuing voltage and then increase voltage with LLC 5 and see wich one solves the problem without sacrificing max frequency too much. Do you think it's also worth to test changes with RAM and SoC or is most likely a vcore issue? RAM is stable with 2h memtest, but 3266 CL14 out of a quoted 3600 CL19 might not be the most safe setting. It's due to how the platform is set up, the IMC is linked to the DRAM speed. So if your running 1700MHz (DDR4-3400) memory the IMC will also run at 1700MHz. When trying to run higher speeds you need to increase the SOC voltage to keep the IMC happy, 1.10V to 1.15V will probably work for 1800MHz (DDR4-3600). I recommend not using XMP on those higher speed kit's and to set them manually instead. This should probably work alright for b-die. If this works then you can of course reduce the VDIMM to a more comfortable level if you wish, though 1.5V is not going to hurt anything. I'm really liking bios ver. 5.10, fixed a few oc'ing quirks on my 1700 like having to use a vcore offset with over 1.30V or it'll lock it to 1550MHz. Now I can just set a fixed voltage of 1.375V and it runs just fine @ 4.0GHz. It also helped with how the CPU handles sub-zero temps. With ver. 3.20 the CPU would force stock settings even though there was an OC set. Now it handles it no problem, aside from the IMC of course. This is with some -15C coolant. Alright, thanks for the help. I will try it out over the weekend when I have time and see if I get lucky and post the results. Thanks! After some more experimenting, it seems that i have to stay with an offset >-0.08v to be stable, still get some fake boots from time to time, but no more getting stuck during windows loading or crashes. 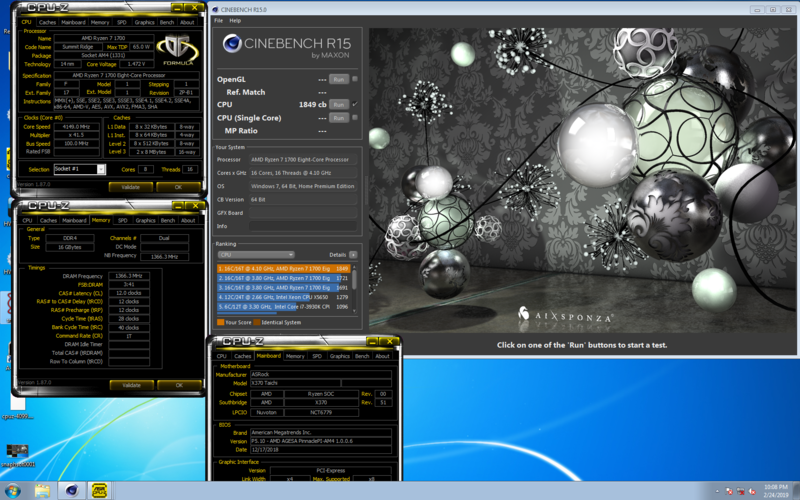 Cinebench gets me a nice 1459, a little less than what i managed with -0.1v offset, but i think it's ok, will try experimenting with vSoC to see if i can lower it a bit too to reduce temperatures and consumption, since in idle hwinfo misures about 7-10w of SoC consumption, making up almost 90% of the total CPU consumption.